I test ride the 4'th Upgrade (UG IV) of the Pulsar 180 DTS-i..
Back in 2001, the Pulsar twins (150/180) shook the sleepy Indian motorcycling scene out of its slumber in such a way that even after almost 9 years later the Pulsar Mania still refuses to fade out. I was a little bit apprehensive about the 4’th Upgrade (UG IV) of the Pulsar 180 DTS-i..
..after all it was virtually the Pulsar 200 with a slightly tweaked 180 cc engine. 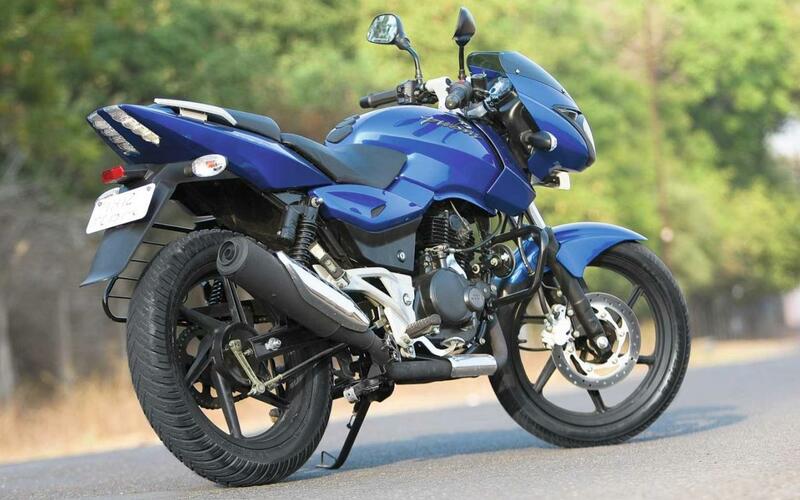 So far the Pulsar 150 has raked in the numbers and the Pulsar 180 has kept the enthusiast engaged. Till the UG III, the Pulsar 150 and Pulsar 180 had shared virtually everything, except the difference in cubic capacity. Both bikes shared the same chassis and appeared literally like, “Twins”. But with the appearance of the Yamaha FZ in late 2008, the Pulsar 180 somewhat lost its edge in terms of exclusivity if not in outright performance. An upgrade was necessary and that’s what the Pulsar 180 got in mid 2009. When the the 4’th Upgrade (UG IV) of the Pulsar 180 DTS-i was launched in mid-2009, I was a little bit apprehensive about it. The upgrade did not seem substantial to me at that time. After all it was virtually the Pulsar 200 with a slightly tweaked 180 cc engine. But after a year, the very sight of the so many Pulsar 180 UG IV’s on out roads have proved my apprehensions wrong. So what’s so special about the Pulsar 180 UGIV? I try to find out..
Looks: "Grown up handsome looks, reminiscent of the Pulsar 200"
In flesh, the Pulsar 180 UG IV now looks all grown up and mature. The Pulsar 180 actually got the chassis and the bodywork of the Pulsar 200 (which was discontinued) and to make things more enticing, it also got the clip-on handlebars and the beefy 37 mm dia. front forks of the Pulsar 220. Even though the oil cooler of the Pulsar 200 was not added in the Pulsar 180 UG IV, it did get the tank scoops, split rear seat, half chain cover, bigger 260 mm dia front disc brake and the chunky 120 section tubeless rear tyre. According to me the Pulsar 200 has been the best looking Pulsar till date and therefore its actually a good thing that the Pulsar 180 UG IV has inherited the handsome looks of the Pulsar 200. In retrospect I can now say that the grown up and handsome looks of the Pulsar 180 UG IV definitely has done the trick of refreshing the product. Riding Stance & ergonomics: "Sporty and Comfotable ergonomics"
Sitting on the Pulsar 180 UG IV is like a deja vu of the Pulsar 200. Both the bikes feel so similar. The riding stance of the Pulsar 180 UG IV is just perfect for me, i.e. sporty yet comfortable (just the way I want). Guys with long legs used to have a problem gripping the tank in the earlier Pulsar 180 versions. Thanks to the rear set foot pegs along with the long wheelbase, the Pulsar 180 UG IV now makes ample room for even 6 ft plus guys to grip the tank. The clip on handlebars provide a sporty yet comfortable stance. The seat height is a bit high and shorter riders (of around 5 ft 5-6 inches height) could have trouble putting both feet on the ground with confidence. Engine and performance: "Smoother engine and slicker gearbox"
The peak power got a slight bump from 16.5 Ps to 17 Ps. But at the same time, the peak torque has dropped slightly. 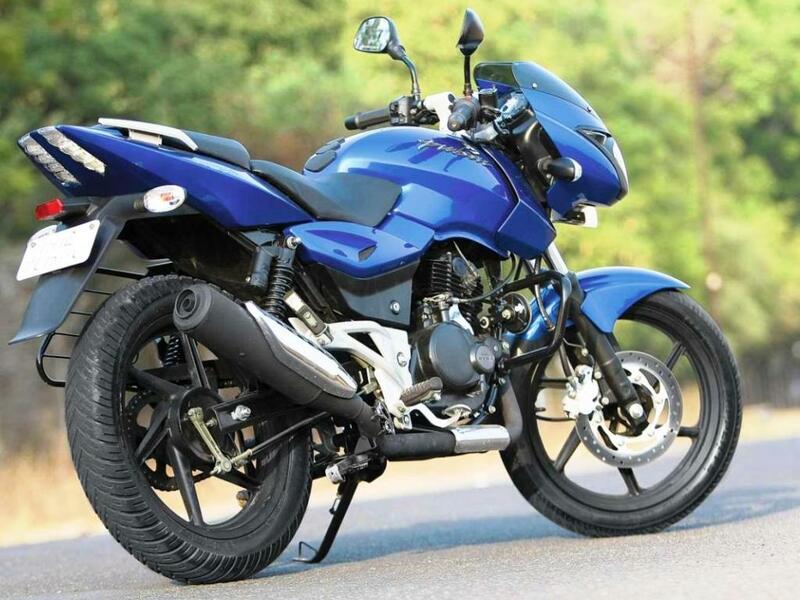 With all the body work of the Pulsar 200, the weight also increased to a kerb weight of 147 Kgs. Engine has become smoother and is now more eager to rev.. The slight drop in the torque and the heavier body weight is noticeable specially in the low rpms. No longer the Pulsar 180 lunges forward from standstill as the older versions. What you get instead is a linear spread of power and torque. The top end is quite good though. 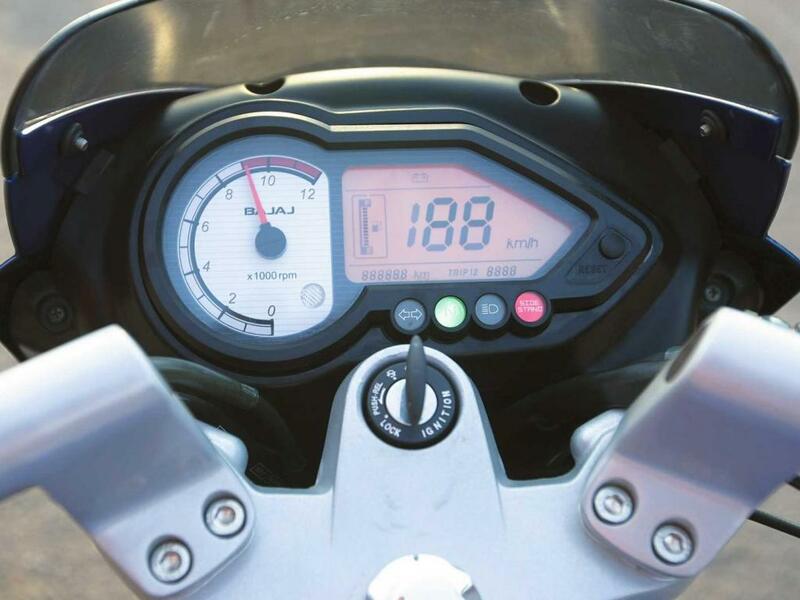 I managed to see a speedo indicated top speed of around 121 kmph on the bike. The tweaked UG IV engine has now got much smoother and more eager to rev compared to the earlier versions. Not that the vibrations are completely absent, but the engine is now more eager to rev. The "toe shift only" gearbox has also become slicker and more accurate in operation. The shift feel is also positive, free from false neutrals and has improved a lot compared to the older Pulsar 180 versions. Ride and Handling and Braking: "Much more stable around the corners, great on highway as well"
The Pulsar 180 UG IV is not a sharp handling track bike..
With the overall bigger dimensions and a longer wheelbase the Pulsar 180 is no longer as flick able and nimble in tight traffic situations. Guys who are looking for a racing track tool in the Pulsar 180 UG IV will be dissappointed. This is not a track tool. The suspension of the Pulsar 180 UG IV is set up for for a plush and comfortable ride. The ride on the Pulsar 180 UG IV is probably one of the best among current Indian bikes. Coupled with the broad seat, long journeys on the Pulsar 180 UG IV is a much more comfortable affair now. The longer wheelbase has made the Pulsar 180 UG IV more stable around high speed corners. Also the extra weight has also made the bike more stable on the highways. The bike is now less bothered by high speeds trucks and heavy crosswinds. Even at speeds of 100 plus kmph the bike remains very stable. Braking on the Pulsar 180 UG IV is stable thanks to the big 260 mm front disc and the 130 cc drum at the rear. The Pulsar 180 UG IV is not a sharp handling track bike but it is more of a comfortable "city + highway" bike. Fuel efficiency and value for money: "Good fuel efficiency for a bike of its size"
According to my friend who owns the Pulsar 180 UG IV, the bike has returned him on an average of around 40-45 kmpl of fuel efficiency so far. That's not too bad at all for a bike of this size and engine capacity. The Pulsar 180 UG IV currently costs around Rs. 71,000 (on road Pune), which is according to me quite good value for money considering the 153 cc Yamaha FZ-16 costs around Rs. 73,000 (on road Pune). Verdict: "The Pulsar 180 has matured as a motorcycle in its UG IV avatar"
The Pulsar 180 UG IV looks, rides and handles like a mature bike compared to its earlier versions. If the older versions can be labeled as a "hooligan" adolescent, the UG IV can be said to have a more stable and mellow character to it. I just wish the engine had a little bit of more torque. Hey Payeng, hope your remember me...MSH apts, b'lore friend!!! You are back to your best about BIKES....keep it going dude!!! Hi Sharath, of course I do remember you.. great to hear from you after a long time. Send me an e-mail me? You can get my mail id in the "Ask me a question" link on the navigation bar at the top. many of my friends dont believe this but i really get more than 50 km/lt even in the city... its one & half year old now but i didnt encountered any problem with my bike. i believe that mileage is best set under its first 5000-10000 km. during this period if u ride it with a bit xtra care, it will surely give best output. high quality engine oil is very essential for great performance.. i always use Motul semi synthetic oil.. its very good. bro it is a track tool surely . I like this most rated bike and planning to buy it, plz suggest me whether it is better than Fz or stunner??? He actually got convinced. . . and even admired your review tooo. . .
Thanx a lot Bro. . . .
keep up the great work. . . .
Am planning to bike this racing tool. but bit worried about the mileage part. does it really gives 50+ if it is maintained well, but as far as i know the showroom guyz promising me that it will give only 40+ PLZ suggest. the review is really awesome. would i be getting a revised puls@r 180 by 2013 coz i am planning to buy in another 2 to3 months if so i will wait for the newer version. this bike is awesome .... i didnt cross speed of 50 and the bike is giving me 60 kmpl in city traffic! !